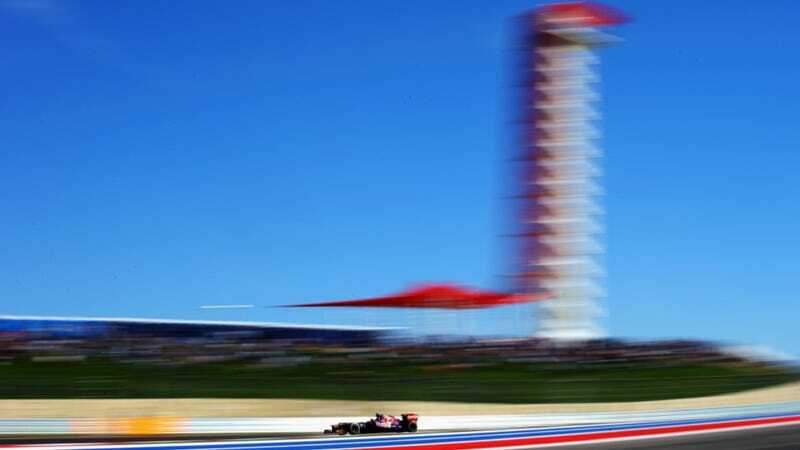 After years of waiting and expecting it to never happen, it's here: Today is race day at the Circuit of the Americas for the first United States Grand Prix since 2007. It's a big deal. Here's your official Jalopnik Grand Prix-view and storylines. Today could be a huge day for Sebastian Vettel. The defending two-time world champion comes into the USGP with a 10 point lead over Fernando Alonso in the standings. If Vettel wins the race, he will clinch the title if Alonso finishes lower than fourth. If Vettel finishes second, Alonso needs to place 8th or better. If he's third, Alonso just needs 10th place to keep his title hopes alive in Brazil. That said, Vettel is off to a great start: He's starting first tomorrow. Alonso sets off eighth. The start in general and row five in particular. F1 standing starts are like nothing in the world. You'll have 24 of the fastest cars and best drivers accelerating from a standing start to more than 100 MPH in a few seconds. They are then going to hit Austin's signature first turn: An uphill hairpin left. It's where I've been watching from all weekend, and while it's wide, there could be some carnage on the first lap. Especially from row five. And that's because two of F1's crashiest drivers will be starting next to each other. Romain Grosjean, who has crashed so much that Bernie Ecclestone asked Lotus to "get him an eye exam" (and starred in our own photoshop contest) and Pastor Maldonado, who seems to hit Lewis Hamilton if they are within a mile of each other, will be right next to each other. They're young, aggressive, and fearless. Tires and a lack of grip have been the talk of the weekend at the Circuit of the Americas. Pirelli brought their medium and hard compound tires to the track, and they aren't heating up as the teams had hoped on the new slick surface. Heat has been hard to come by, so we've seen spins and some big slides by the drivers. But more than that, flat spots could be an issue. F1 cars don't have ABS, so locking up the tires is a possibility. As the guys got more and more aggressive over the course of the weekend, the amount of lock ups I saw into turn one steadily increased. If there is a big lock up in the race, the tire can develop a flat spot which will then cause a vibration. That equals a pit stop, lost track position, and a lost race. Obviously, the awesome turn one is a good corner to keep an eye on. I'm expecting a lot of passing there. The turn nine/ten complex is fairly slick, with a few spins in support races. Turn 10 is a flat-out kink, but off line (like most corners on this very new track) seems to be incredibly slippery. That could be a problem. Turn 11 is a good passing opportunity, as is the long run down to turn 12, which will be the zone where DRS works during the race (if you don't know what DRS is, you need to read our guide to F1 racing). McLaren Team Principal Martin Whitmarsh told us yesterday that turns 17 and 18 are the real tire eaters. Enjoy the race and let us know what your storylines are below.